What Car Should You Buy To Replace Your Diesel Volkswagen? As Volkswagen’s diesel-cheating saga finally starts moving toward resolution after seven months, the automaker will offer to buy back some 500,000 TDI diesel cars and compensate owners. There are going to be a lot of folks with money to burn on another ride. 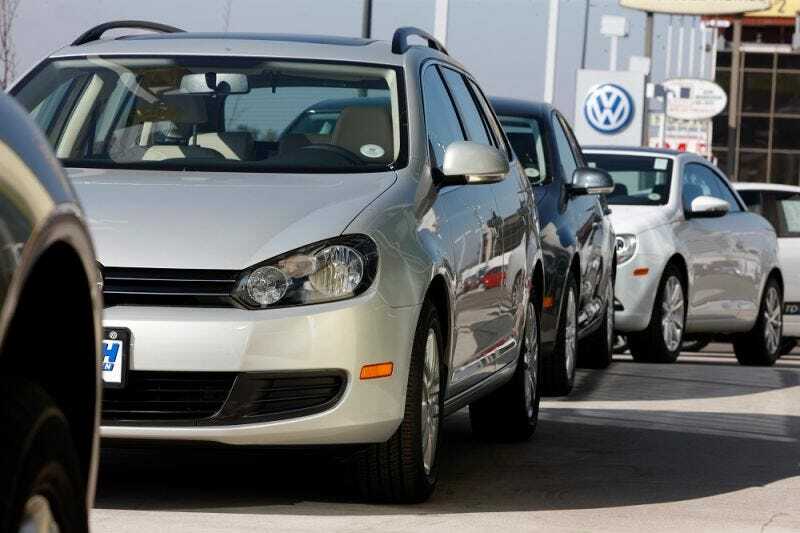 If that includes you, here are some vehicles to consider if you plan on replacing your TDI. A lot of owners will likely have a bad taste in their mouth about the Volkswagen brand from now on. Buyers of TDI vehicles tended to be especially loyal, and either bought their cars for prodigious torque and fuel economy or because they believed the “clean diesels” were good for the environment. Then the latter group found out they were polluting far more than your average driver. It’s understandable that many of these folks may want to abandon the brand and go elsewhere. Most buyers that are frustrated with Volkswagen will most likely choose a direct competitor within the same segment, but they should keep in mind that they will now have the opportunity to get a more interesting car for their money. Most Jetta buyers picked the compact sedan because they wanted something a little nicer than the typical small cars, in addition to a fuel efficient motor that provided a little bit of punch. Hyundai’s Elantra is sharp-looking but inoffensive. It’s a value-packed car starting at $18,000 with the sweet spot being the Limited trim at just over $23,000. At this price, you will get leather seats, a seven-inch infotainment display with Android Auto and Apple Car Play, Blind Spot Detection, and a rear camera, all in a package that gets up to 38 MPG on the highway. Maybe you like the thrill of rolling the dice with German reliability. This little Audi will give you everything you love about your Jetta, but with a more premium feel. The 1.8-liter gasoline motor will get up to 33 mpg on the highway, which is a bit less than you are accustomed to, though you won’t have to pay extra for the diesel fuel. So you shopped the incredibly crowded and very competitive mid-size sedan segment and settled on the Passat. Most likely you bought the VW because it was the only car at that price point with a diesel motor, so you could brag to your friends that you can hypermile to 50 MPG. Now you’re thinking it’s time to fall in with the crowd. It’s an Accord. There really isn’t much to say. If you want something that screams “YOU MADE THE SENSIBLE CHOICE!”, the Honda is your car. It is comfortable, fuel efficient, it has all the features you expect and a long history of bulletproof reliability. Once the factory warranty runs out you won’t be looking at the odometer like a ticking time bomb. So here is the good news: even though VW was not totally honest about the cleanliness of their diesel engines, that doesn’t mean you have to give up driving a diesel-powered German sedan. Now you can experience the engineering and driver engagement of a German car made for German drivers. The BMW 328d provides all the diesel torque and fuel economy you love with rear-wheel drive antics and a much more premium feel. It even comes in wagon form if you like! You probably choose the Golf because you wanted a fuel-efficient hatchback with a nice interior and something that wasn’t a total bore to drive. Perhaps you opted for the six-speed manual for that extra level involvement. Your next move is going to depend on your priorities. You may be tempted to try to make up for all those miles of spewing noxious pollutants into the atmosphere with the default car for people who want to limit their carbon footprint. The Prius will certainly fill that role and give you plenty of trouble free miles all while sipping the least amount of fuel it can. Let’s run down the list and compare the Mazda to your old Golf. Hatchback? check. Fuel-efficient? It gets up to 40 MPG when equipped with the 2.0-liter engine. Nice interior? The Mazda punches above its price class for fit, finish, and features. Fun to drive? This is the same company that makes the Miata; trust me, you will enjoy your commute. If you so desire, you can still get three pedals to row your own gears. This one’s always a solid pick. I feel bad for you folks the most because if you jump ship you will no longer have access to the weird automotive hipster trifecta of manual diesel wagon. Sadly, you are going to have to give up at least one of those attributes after this. The Outback is basically the Swiss Army knife of mainstream cars. Few other vehicles offer the same overall balance of safety, reliability, fuel-efficiency, and practicality like Subaru’s wagon. It’s not quite as engaging to drive as the Sportwagen, but as a family car, the Outback won’t let you down. I get it—you aren’t fooled by these wagon crossover things. You want a real wagon, something lower to the ground that drives like a sedan, but with more cargo room. My longroof loving friend, you need a Volvo! With the Volvo V60, you will have to give up a little bit of cargo capacity. What you will get in return is a safe, fuel efficient, and upscale car that has some of the most comfortable seats in the industry. Also, let’s not forget the seven-year, 100,000 mile comprehensive CPO warranty. You bought a Beetle! You are among the millions and millions of people who can say they owned Volkswagen’s most iconic cars. So here is some bad news: people don’t really buy Beetles anymore and its days may be numbered. Giving up your Bug could be a tough decision. The Beetle is a car that makes a statement; it has character. You are probably looking for a bit of personality in your next ride as well. The Kia Soul is very affordable, has a ton of features, and boasts a long warranty. Best of all, the Soul is different. Some people dig it, some don’t; that is part of the charm. Maybe you want to stick with the retro vibe of the Beetle, but would prefer to change it up. The Mini Cooper may not have he same level of global proliferation as the Beetle, but its lineage has its own unique place in automotive history. Would you like two-tone paint, racing stripes, and rally lights? With Mini’s customization options, you can have it all. The Cooper is also a hoot to drive with a punchy three- or four-cylinder turbo engine and hilariously good handling. Should I Buy Another Volkswagen? When you take your TDI back to the dealer, you can bet they are going to do their best to put you into another VW. Whether or not you choose to do so will depend on a couple of factors. Maybe you really did like your VW and the only downside was that darn diesel powerplant. You could be just as happy with a gas-powered version of the same car. Or you could take advantage of cheap gas prices and get something sporty like a GTI, Golf R, or GLI sedan. But even if the Volkswagen dealer is going to cut you a big fat check, that doesn’t mean you should spend it at the same place. Examine all your options. Do some test drives. Run the numbers. Is the deal they are offering you on the VW competitive to the other deals you could get from another brand? There are tons of wonderful cars out there. Take your time, shop around. Remember, you are going to live with this vehicle for a while, make sure it’s something you really want.